The Twelve Dancing Princesses has been a favorite fairy tale of mine since I was a child. So I was very excited to see Jessie Burton and Angela Barrett’s take on the story with The Restless Girls. In this version, the twelve princesses are locked away after their mother dies in a car crash. The only way to keep the princesses safe, their father reasons, is to keep them in a room with no windows and nothing that could encourage them to be as daring as their mother. Being their mother’s daughters, however, the girls will not accept their father’s plans. They still have their imaginations. Under the direction of the eldest princess, Frida, the girls head down a path that leads them to a magical land full of silver, gold and diamond forests where animals talk, sing and dance to their hearts content. The Restless Girls differs from source material in one very big way — in this version, the princesses themselves do all the rescuing. As their father digs his heals in, the girls become more resourceful. Rather than limiting their knowledge and with for adventure, he fuels it. 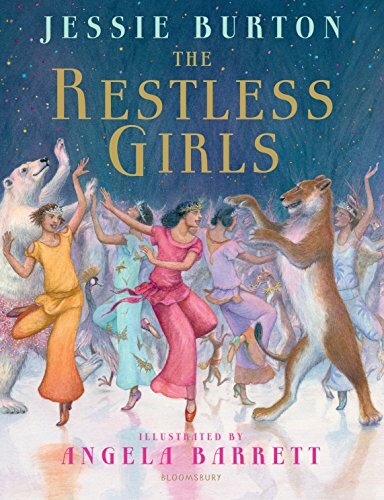 The Restless Girls has a decidedly exotic feel to it, particularly in the illustrations by Angela Barrett. My advanced reader copy did not include all the illustrations, but the ones that were there added another layer of depth to the story. Though the publisher’s suggested age range for The Restless Girls is 8-12, I think it will appeal to younger readers. At 160 pages — some of which are full illustrations — it’s a short book, and not particularly difficult to read. I wouldn’t be surprised if this became a read-aloud book with my own daughter in the next year or so (when she’s 6).